Booklet FD2B Machin 7p Plain Miscut Pane UFB6A . The booklet is coloured grey-green and red-brown. Country Craft Series, designed by Eric Stemp. 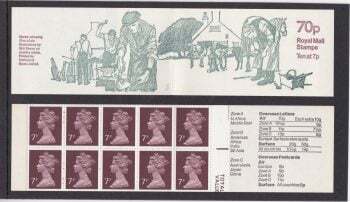 FD2 No 1 Horse-shoeing, issued in February 1978. Royal Mail Philatelic Bureau Stock Number – no number allocated, although they are listed in the Stock List of November 1978. 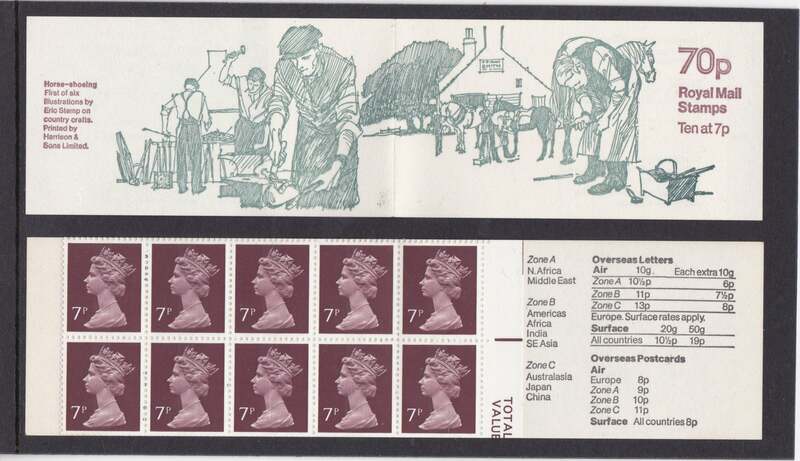 Stamp issued 13th June 1977. Printed by Harrison & Sons Limited. The booklet also contains MISCUT pane number UFB5A with selvedge at the left. Pane perforation is type E.
Booklet FD2B. Concise (2017) catalogue number of pane: pane not listed. Specialised catalogue Vol 4 Part 1 number UFB5A/FD2A (Selvedge at left) containing 10 x U154. Booklet without cylinder numbers (contains 10 x 7p, U154/X875). 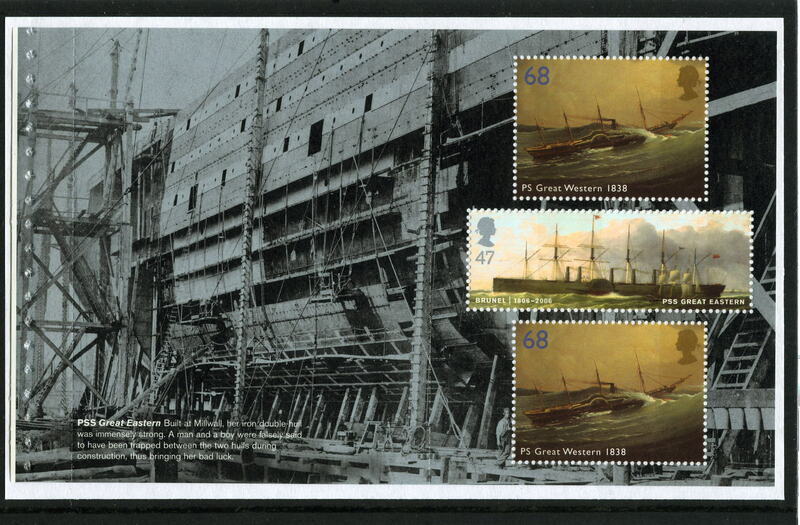 Unmounted mint in excellent condition. 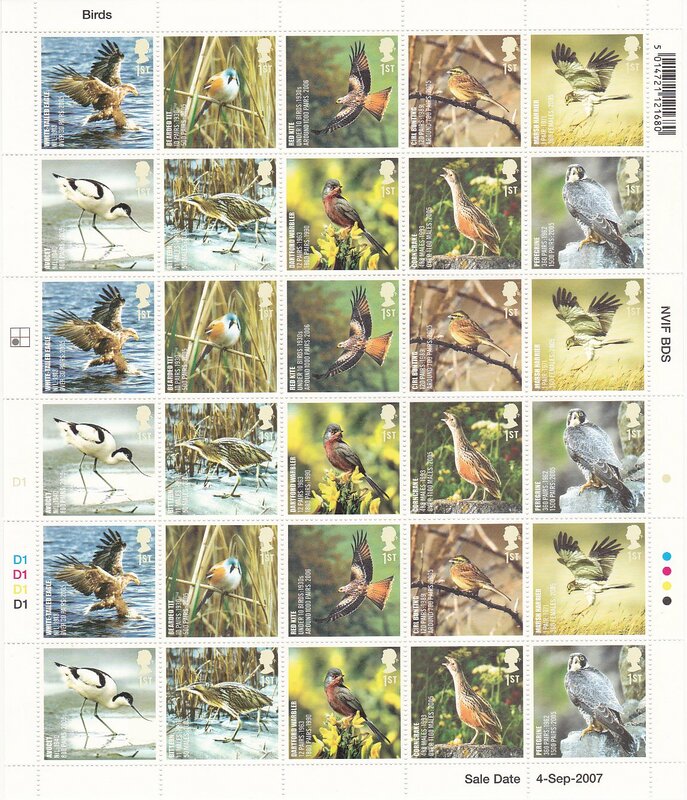 Booklet FD2B Machin 7p Plain Miscut Pane UFB6A. Recorded Delivery or Registered Post is available if required. Consequently, compensation for loss or damage can be claimed if this option is taken. We mention Stanley Gibbons catalogue numbers where it is possible. These numbers are either from the “Concise Stamp Catalogue” or from the “Specialised Stamp Catalogue Volume 4 Part 1 or 2”. We will try to mention any other numbering that we may use if not covered by the above. Sometimes particular stamps, Smilers sheets, booklets, miniature sheets, or cylinder blocks are not recognized anywhere. Hence, in this case, we would use our own expertise to describe and value that particular item.